I used to think that gardening was hard on my back. Turns out, nothing does a number on your body like growing, birthing and taking care of a baby. I went to chiropractor visits during my pregnancy, have back pain from the epidural spot and constant backaches from breastfeeding positions and carrying a now 16, almost 17 pound baby! Now, typically, when having muscle and back pain, DH would just rub some tiger balm on the spot, the area would get warm and relaxed and I would spend the rest of the day smelling like ... tiger balm. When I was younger, it was all about eucalyptus oil in a green bottle that was my mother's cure all. And then I'd go around smelling like koala bait. Regardless, they were the solutions I would turn to over some of the more chemical based products like Bengay (the Methyl Salicylate is toxic in large quantities) which also smells terrible or even oral pain relievers. I belief is that treating the site of the pain with increased blood flow to the area is the best way to quickly heal. Oral pain relievers mask the symptom, topical creams help cure the problem. I was excited to try Noxicare when they sent me their product. Unfortunately, I'm breastfeeding and Noxicare is not approved for use on pregnant or nursing women. Luckily, DH is an avid cyclist and regularly has leg and knee pain so he tried this product out for me. Now, Noxi is an unfortunate name choice in an all natural health related product. It imparts the image of noxious smelly gases and other toxic things. 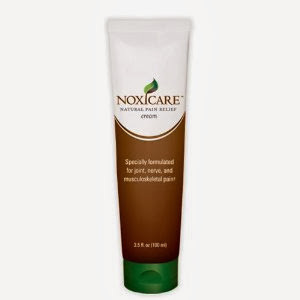 Turns out, however, that Noxicare is a natural product. I've recently been very conscious about my smell because babies are very sensitive to smell. I want BB to be able to comforted by my smell and was concerned that when DH put this product on and came to bed, the smell would be unpleasant like so many other natural products. We were both pleasantly surprised that this cream smelled like nothing. DH was particularly impressed because Noxicare created a warm sensation in the areas he applied it in, which to him felt like increased blood flow to the area, without the telltale menthol smell that tiger balm, green eucalyptus oil and Bengay reeks of when applied. He could actually use this at work and not offend his co-worker's noses. Was it as heating as the aforementioned alternative options? No. Did it do a good job? Yes. Would DH use this instead of Tiger Balm? Yes, simply based on the effectiveness of the product partnered with the lack of detectable smell. But you don't have to take my review for it. Try it for yourself for free if you win the giveaway below. Remember, I have such a small but awesome group of readers that if you enter, you'll have a darn good chance of winning. Contest ends January 24, 2014. I had a lot of pelvic and lower back pain but I had a very large baby boyboy who separated my pelvis.